Another bit of GOOD NEWS! I'm a MOJO girl! I was asked to be on Scrap Mojo's DT. It's a fabulous and inspiring challenge blog. Check it out! That made my day! Here I am in all my "Dali" Mojo greatness. 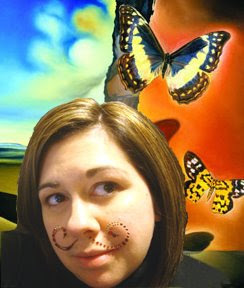 I love this painting my Salvador Dali... Don' t you love my Prima moustache? Hi there! I love your blog and you're an art teacher (I taught art years ago at a Montessori school-miss it!) which is awesome!